My camera failed late yesterday just as I tried to photograph a posy of echinacea, chrysanthemum, lavender, salvia and zinnias gathered from my autumn garden. At this point in the season there are not many blooms of each kind, except for the pass-along pale yellow chrysanthemum that is just coming into its own. I had collected a fair showing so it is disappointing to have encountered this technical difficulty, but here is a photo of the chrysanthemum at early morning on Saturday. In place of the home-grown flowers I will share instead some store bought floral indulgences that I used Tuesday when hosting my book club. The book was A Gentleman In Moscow by Amor Towles. Do read it if you have not yet–I found it one to savor. 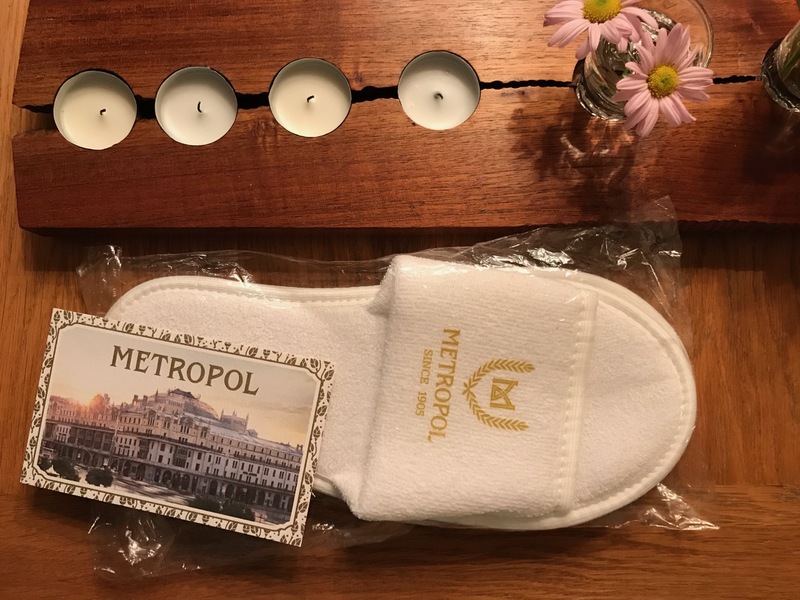 The story of a count in post-revolutionary Russian, the setting was a grand hotel in Moscow called The Metropol. In a wonderful bit of happenstance, one of our book club members stayed in that same hotel the week before and brought me a keepsake. It was fun to prepare multiple arrangements as I imagined such a fine hotel would offer generous floral displays. 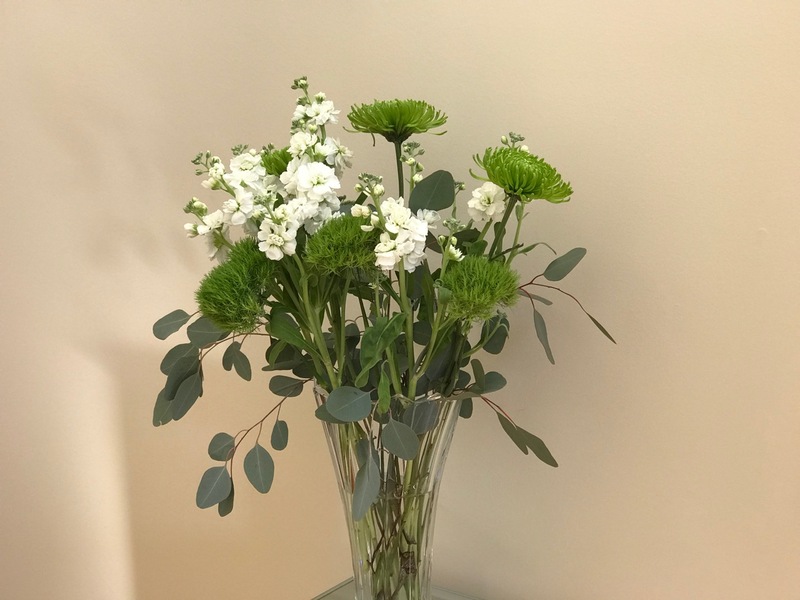 White stock, Eucalyptus, Spider Chrysanthemum and ‘Green Trick’ Dianthus stood in the foyer. For the food table there were roses accented with Hypericum berries (photographed in the foyer). A large vase of Alstoemeria, Eucalyptus, Spider Chrysanthemums and ‘Green Trick’ Dianthus sat atop the piano in the living room. A trio of smaller vases on the window ledge were filled with Eucalyptus. This entry was posted in garden and tagged 2017vase, flower arranging, flower design, in a vase on monday, nature photography on October 30, 2017 by pbmgarden. Your book club members must have been thrilled by all your lovely arrangements. They are all gorgeous but my favourite has to be the one with the Green Spider Chrysanthemum, Alstroemeria, Green Tick Dianthus. I think my green Chrysanthemum is the same; I must look for the others as I love green flowers almost as much as white ones and they are actually more useful Thanks for the recommendation for the book too. Yes, all those greens captured my imagination too. I would like to grow that green spider mum and should look for mums on sale in Nov as you did. It’s versatile in use with other flowers and nice on its own. Let me know if you enjoy the book. 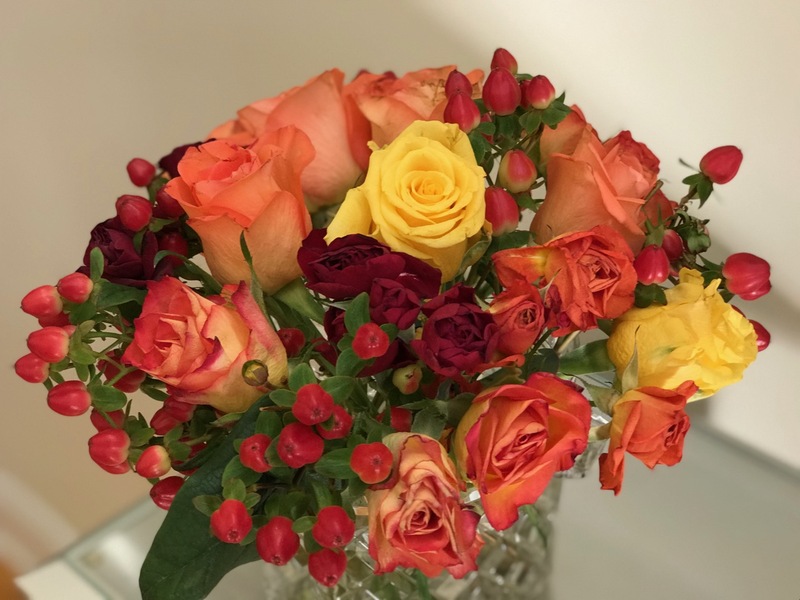 I love the warm hues of the berries and roses; such a pretty combo. Bet your club had a terrific time! We did have fun. Almost everyone loved the book. Since I don’t grow roses it was a treat to have these in the house this week. I always do a bunch of vases when I am having friends over so it is fun to see what you did and where you put things. I have friends who have read that book and everyone seems to really like it. I need to add it to my list. Love that mum; a real beauty. It’s fun isn’t it to spread flowers throughout the house. I’ve noticed your tendency to make each room special. Enjoy the book if you choose to read it–I really liked spending time with it and hated when it was over. 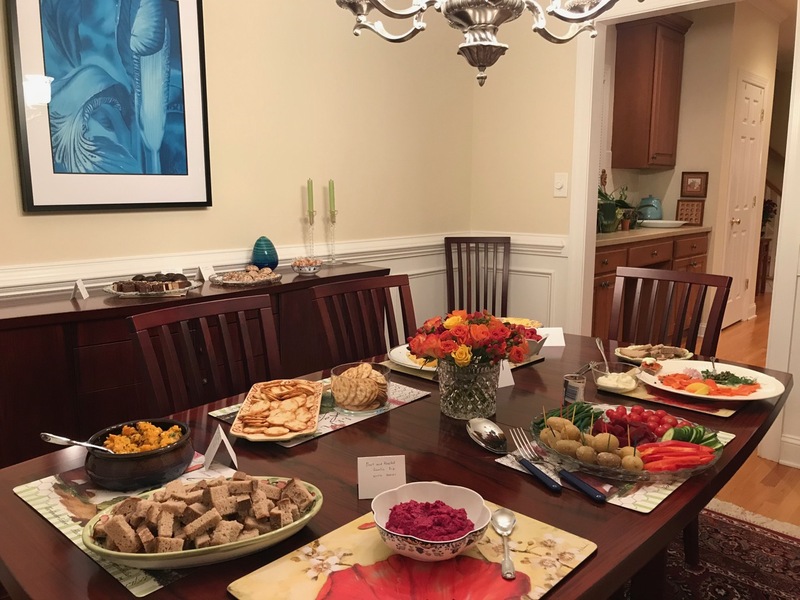 Too bad about the technical failure but oh these vases are as scrumptious as your lunch….I am sure your book club loved it all. 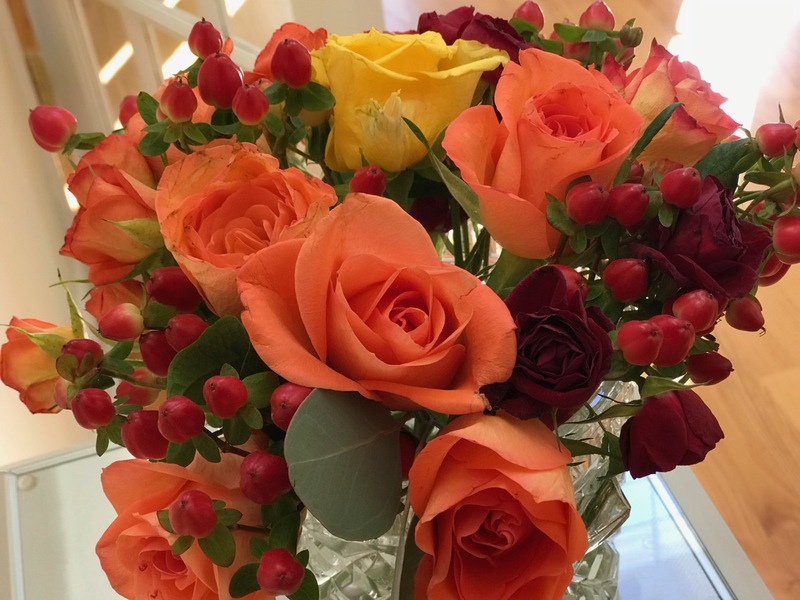 I especially love the color of the roses and berries. And I love getting new recommendations for good books. I will check this one out. Hope you’ll enjoy the book Donna. Thanks for the kind words about the flowers. It was really fun to splurge on buying a great quantity of flowers to play with this week. Gosh, that’s a lot of effort you put into your book club hosting – is it a high spot in the local social calendar? 😉 I especially like the colour of the alstromerias and the wonderful rose ensemble and am sorry not to have seen your ‘real’ Monday vase. Will you be able to get your camera repaired, do you think? I have an appointment to take my phone in for repair (and that will fix the camera), so I’ll try to post an update. 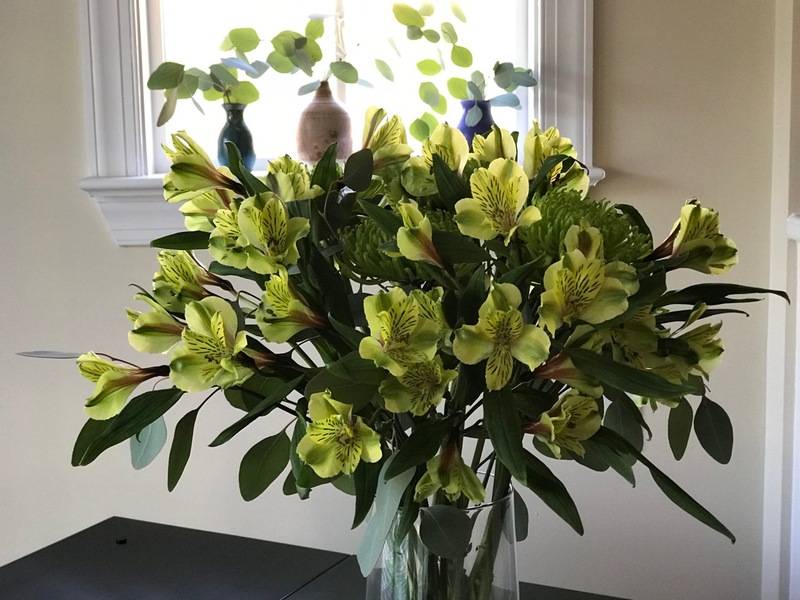 Alstroemerias are great flowers. 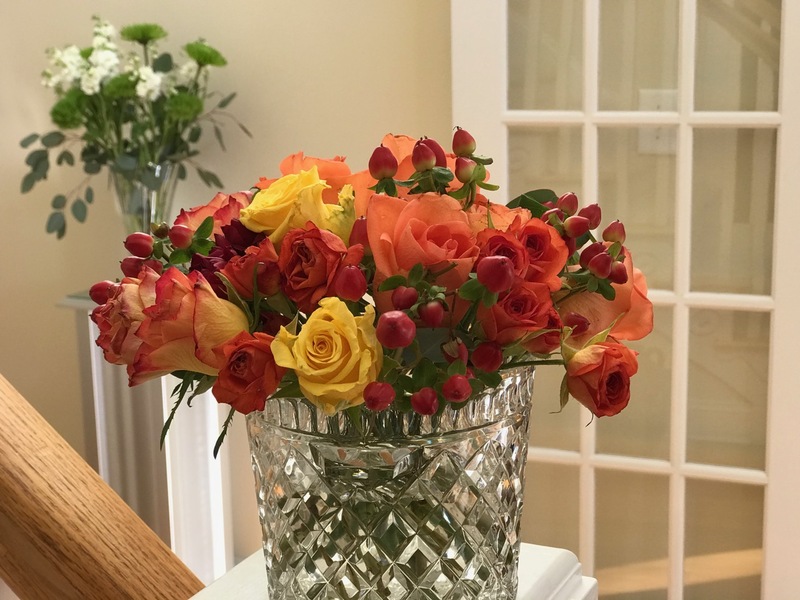 Great variety of color choices and so long-lasting in a vase. I host book club about once per year and don’t usually make it such a big deal. This book lent itself to abundances of foods and flowers though and it was fun. I’m sorry to hear of your technical difficulties but you more than made up for the glitch with photos of your book club adornments! You put my book club to shame. We read “A Gentleman in Moscow” too, as well as Towles’ earlier book, ‘Rules of Civility.” Most of our members preferred “Gentleman” but I was more engaged by “Rules”. Regardless, I look forward with anticipation to whatever Towles produces next. My iPhone is the culprit. Getting it fixed tonight. After finishing A Gentleman… I went back and read Rules of Civility and liked it too. Will definitely look for Towles’ next book also. Love the greens in the flowers and the Hypericum berries. Have to ask, were Moscow Mules served? Moscow Mules were planned but I actually never got them made. Everyone was satisfied sticking to wine and/or a lemonade drink from Moscow. Moscow Mules ingredients are on hand though for when the mood strikes. I’ve never actually had them. My nephew’s girlfriend loves Moscow Mules, I had never even heard of one. Come to find out special glasses are made for them! I’m sure your posy was lovely though we’ll never see it. You’re Moscow arrangements are beautiful and I can smell the stocks. 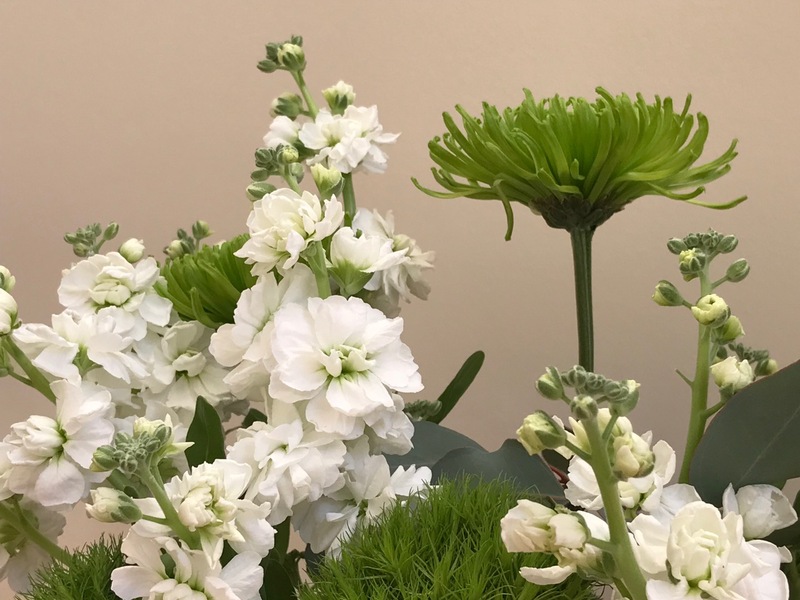 I love those white and green flowers together. Stocks do have the loveliest fragrance, don’t they? Sorry about your camera, that can be so frustrating. Elegant arrangements and table setting for your bookclub meeting. (Ours are rather low key in comparison. 😉 ) I think the roses and hypericum in the crystal vase fits the book theme perfectly! Technical difficulties have been resolved. If there was a piece of luck in the episode it was that I had just hosted book club. I don’t usually make such a fuss over the food and flowers for it but the book lent itself to indulging. I am impressed, my book club just gets a coffee and a slice of cake if they are lucky. Lovely arrangements. I am mad on green flowers, Dianthus Green Trick is gorgeous. 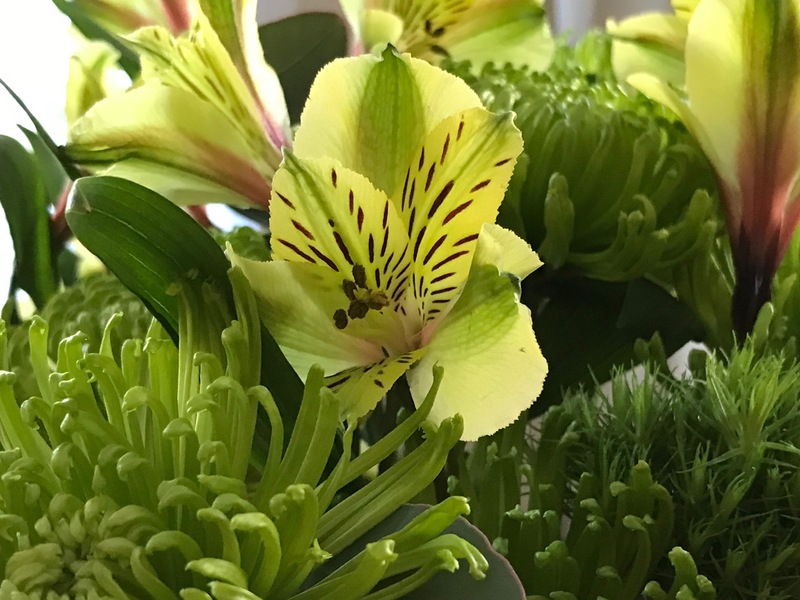 Oh and what a fabulous alstroemeria. As I’m so late replying to comments this week I can attest that all these flowers lasted extremely well. Dianthus Green Trick is such a fun flower. I imagine your book club is delighted to be served your cake! I don’t usually make such a fuss but it is fun sometimes. 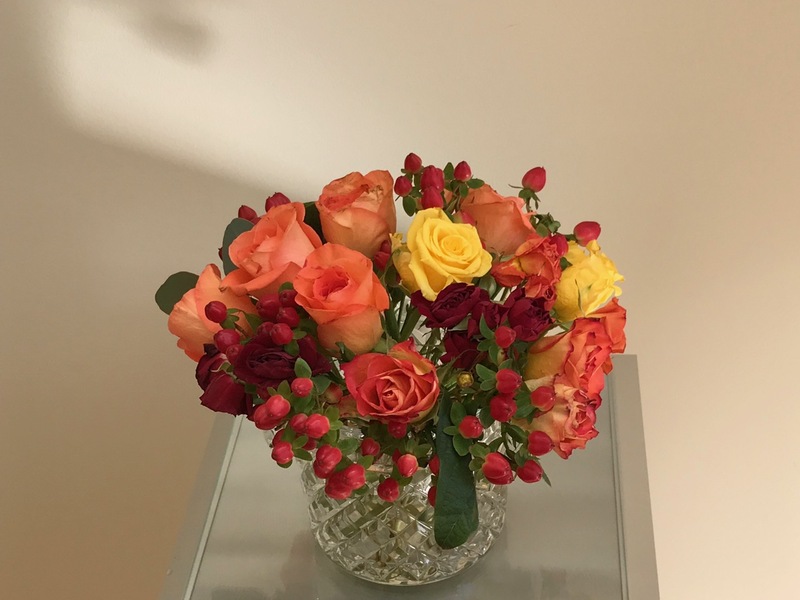 You have some beautiful vase arrangements–I don’t know where to start, they’re all great! Re: the book, gosh, that sounds fascinating. My book club is about to pick books for next year, so I’ll consider this one. Thanks! You captured my attention with your post title, in light of today’s current events. Hi Beth. Most members embraced this book enthusiastically. I’ll be interested to know if you read it and how it is received. Hadn’t realized just how many ways this post’s title might be interpreted. Would love to help write an ending for the current political situation. Your house looks so welcoming with all those beautiful flowers Susie! I especially like the roses with the Hypericum – a lovely combination. Thank you Cathy! Hypericum is great on its own or as a nice filler. I don’t grow it but keep thinking I should look into it. What a delight. 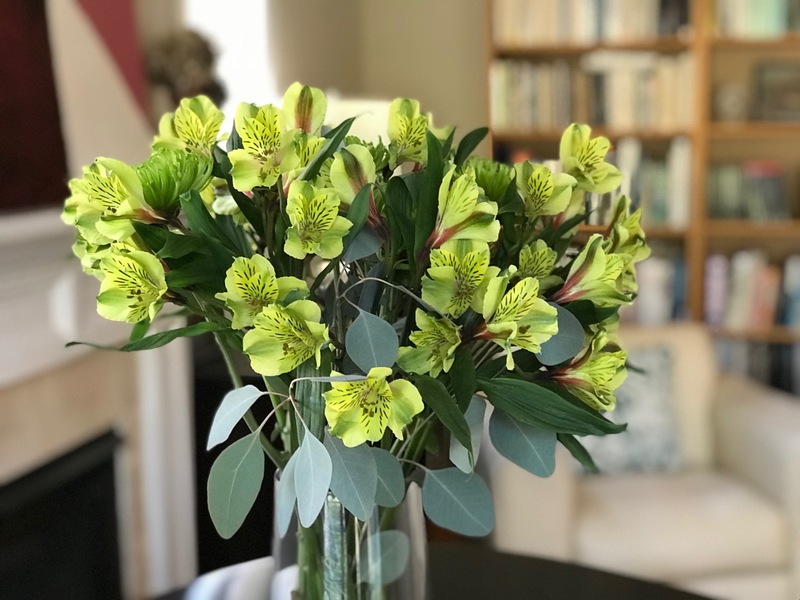 Each vase so special, although I have to say that Dianthus ‘Green Trick’ and that sumptious alstromeria wlll be what stick in my mind – but hang on, luscious hypericum berries with roses as well! I once picked a few hellebore and some coloured stemmed willows for a book club meeting, but your efforts are above and beyond. I’m sure that your efforts were greatly appreciated. Sounds like a fascinating book too, must google and find out more! Cathy, I’m sure your hellebore and some coloured stemmed willows were lovingly arranged and beautifully displayed and well appreciated! Aren’t book clubs fun? As I’m late making replies to comments this week, I can report all these flowers have lasted very well. Good to know! They were such lovely vases!